Yuck! It's another wet, drizzly day here in the Maritimes. Sure, it helps the flowers to grow. But it also means that we don't get out to enjoy them unless you're dressed like a duck! Oh well, the sun will shine again. In the meantime, I like to liven up my wardrobe with happy colors. Today is Rednesday; so reds (or variations thereof) are the choice. 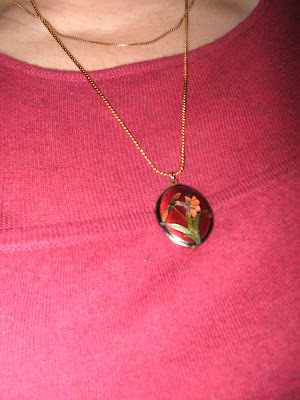 I'm wearing this soft, light-weight raspberry sweater with a Cloisonné enamel pendant, a Xmas gift from my hubby when we were just young. 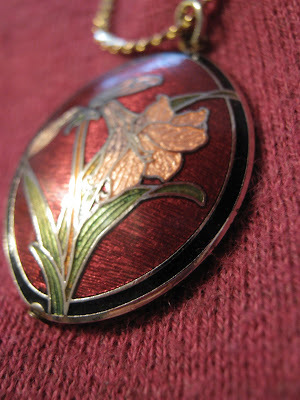 Cloisonné is an ancient technique for decorating metalwork objects, in recent centuries using vitreous enamel. The decoration is formed by first adding compartments (cloisons in French) to the metal object by soldering or adhering silver or gold wires or thin strips placed on their edges. These remain visible in the finished piece, separating the different compartments of the enamel or inlays, which are often of several colors. Cloisonné enamel objects are worked on with enamel powder made into a paste, which then needs to be fired in a kiln. 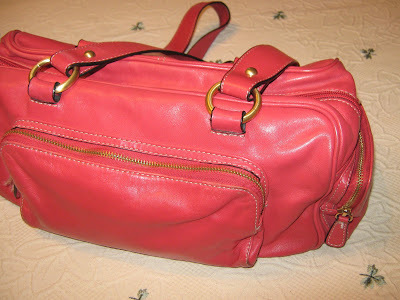 My handbag of choice for the past 2 weeks has been this baby. 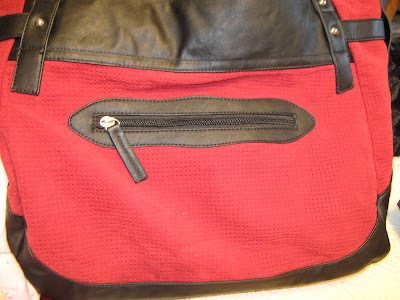 Soft, sweet leather with lots of room and little pocket pouches. And besides my handbag, I usually have a tote bag with me to carry a book or magazine, an apple and other necessary items for the day. Again, this is the one I've been using for the past couple of weeks. I'm just a red girl today. Now, I'm off downstairs to have my breakfast while the girls finish their morning preparations for school and/or work. And while I drink my tea, I'll be looking through this book and continue my dreams of summer vacation. Happy Rednesday! And I'm joining Sue at It's A Very Cherry World! for more Rednesday posts. Happy Rednesday! I love the pendant, and your leather handbag. Hope the weather picks up! Well I do like to do "matchy" too, even though I LOVE What Not To Wear. Your red handbag is pretty and I really like your necklace. Sounds like you looked pretty darn snazzy for work today, and I wish you had included a full shot of yourself so we could see! I have a pair of earrings very similar to your necklace. My husband bought them for me on our honeymoon a million years ago, and I've loved cloisonne ever since! With all those lovely reds, it should be a brighter day for you. A very Happy Rednesday to you. That necklace is to die for and I adore you red tote. The heck with Clinton and his gray stereaked cohort...I love matchy! May I borrow your traveller's guide, please? 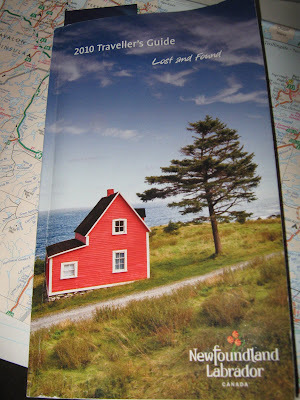 I'd love to visit Newfoundland. You are the darlingest thing out there!